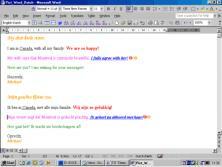 Translation Software for Windows for English and Dutch languages. PARS Professional is an efficient computer-aided translation tool for generating draft quality machine translations. If you need a text to be translated quickly and at no cost from Dutch into English or vice versa, PARS is an excellent tool. The system is based on a General Dictionary containing about 100,000 words and phrases in each direction and a set of specialized dictionaries: Polytechnic and Business. PARS Professional integrates with MS Word, Excel, PowerPoint 97/2000/XP/2003/2007 and Internet Explorer 5.5 and above. It translates MS Word files and Internet web pages, and it also works in the drag-and-drop mode, for example, to translate e-mail messages. PARS allows you setting translation options, such as displaying or hiding translation variants, searching for new words or displaying translated text. You can also add words and phrases to the PARS dictionary or edit existing entires using PARS Dictionary Editor. PARS integrates with Internet Explorer 5.5 and higher and gives you the possibility to translate Web pages with fully preserved web page format. To translate e-mail messages or simple texts without running MS Word, PARS drag-and-drop mode is a convenient way to do it. Just highlight a text and drag it to the PARS panel. The translation will immediately appear in a separate window. You can then paste the translation to any program. Full integration with MS Word, Excel, PowerPoint 97/2000/XP/2003/2007. Fully preserves Web page format.